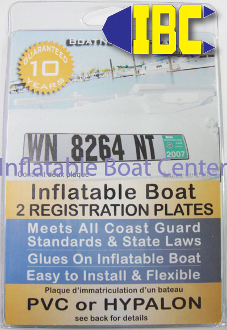 The boat number plate kit comes with a redemption code that is used on a secure webpage to customize your order for correct fabric type (Hypalon or P.V.C. ),color, and registration #s. The number plate is then manufactured to order port and starboard sides and shipped directly to you. This kit meets all 50 state's registration requirements, as well as Dept. Of Homeland Security, and U.S. Coast Guard's requirements. Once your registration #s are issued to you by your State's Agency it's as easy as 1 2 3 ! Easy to glue on and permanent, suitable for all inflatables R.I.B. or rollup Hypalon or P.V.C..